PVC flooring can be seen in households, shopping malls, offices, hospitals, schools, factories, fitness centers, and other public areas. 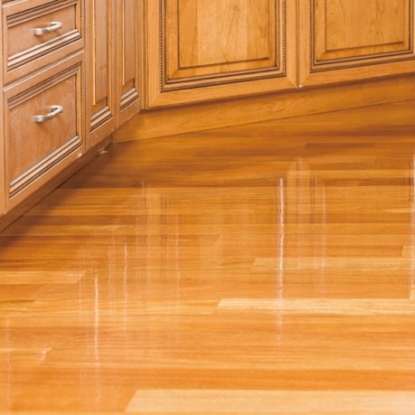 PVC is the main material of plastic flooring due to the cheap price, Formaldehyde free, no water absorbent, self-extinguishing property in favor of recycling, and authentic appearance caused by modern printing techniques that make it difficult to tell the real stone/wood floor from the PVC one. We offer HMPSA that can tolerate plasticizer for PVC flooring, of which bonding won’t be affected after being stored for a long while. Tex Year UV resins offer PVE matte treatment, scratching resistance, and abrasion resistance for PVC flooring. Plasticizer ooze tolerable, good cohesion and self- adhesion won’t open while bonding. No glue migration after storage for a long time. Solvent free, low odor, short setting time, scratching& abrasion resistant. Substrate won’t open after being hardened, which create nice and flat floor.